In C# 7, a lot of new features have been introduced, and also enhancement have been done for some features. I will be covering all those things in context of Visual Studio 2017 RC. Given below is the list of features which I am going to explain in this article. Some of the features are not yet supported in Visual Studio 2017 RC and are still under development. Even C# 7 has not been developed completely and still it is in preview mode. You can ignore some of the features of C# 7 right now and focus on the features which can be tested in Visual Studio 2017 RC. Below is a pictorial representation of the major features of C# 7 which are supported in Visual Studio 2017 RC. Using nested functions inside a function is called local function. To understand how local function works, just have a look at the below code and see how you are going to write and call Add() and Multiply() methods. In the above example, I have used 2 nested functions “Add” & “Multiply” and you can see that those can be called from anywhere inside the parent function even though I have called inline function “Add” inside another inline function Multiply. In the first example, you have seen that nested function is returning void but there are no such restrictions and it can also return any other type. In this example, I am going to create a local function “CalculateMarks” which will calculate total marks and return it as decimal datatype. So far, I have explained the use of local function for printing some values or for returning a calculated variable from local function but apart from that, you can do a lot more. In this example, I am going to explain how we can use local function instead of recursive function. Calculate factorial with recursive function. I know that most of the readers are aware that it is not necessary to call recursive function to calculate factorial . You may be thinking that if the factorial can also be calculated without using recursive function, then why I am discussing about recursive function. I am discussing recursive function because I want to compare recursive function with local function, and suggesting you replace the recursive function with local function whenever performance matters. Local function does not need to maintain call stack where recursive function maintains call stack. So, in the above screenshot, you can see that no extra call stack has been maintained. I want to mention one more thing for new readers (who are not aware about call stack limitation). If your call stack is too long, your application will fail. Let’s try the same application for calculation of factorial of 9K. You can see that the recursive function is throwing “System.StackOverflowException” exception and application has crashed. 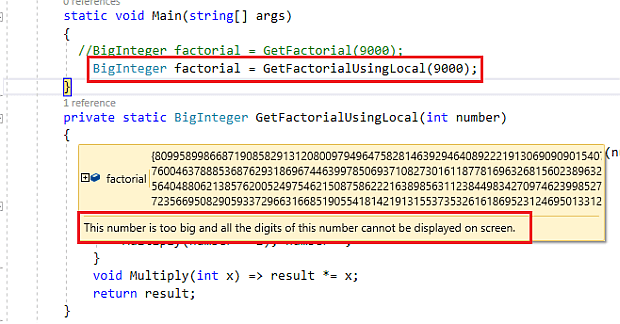 Now, call local method to calculate the factorial of 9k. Below is the complete code for the same. You can do more experiments on local functions. As you know that before C# 7, two types of notations were supported in C# – decimal literal and hexadecimal literal. So, you can see that when you are not using any prefix with integer data type, then it is by default denoting a number in decimal system whereas for a hexadecimal number, we need to use prefix “0X” or “0x” (you can use either small ‘x’ or capital ‘X’). But, when you print it using Console.WriteLine(), then it will always print it in decimal value. Below is an example for the same. In C# 7, the same way, you can also declare a binary literal. You can use “0B” or “0b” for binary literal. So, in C# 7, you can represent integer in 3 ways – decimal literal, hexadecimal literal, and binary literal. Digit separator is also a new feature in C# 7. We can use one or more than one Underscore( _ ) character for digit separators. Sometimes, it is required when we are going to represent a big number. So, the code snippet would look something like. C# supports the feature of pattern matching. We can do a lot more using this. Below is a simple code snippet. This is a very simple example but pattern matching supports a lot of patterns like Type Pattern, Constant Pattern, Var Pattern, Recursive Pattern, Property Pattern & Property Sub-pattern, Switch Statement, Match Expression, Case expression, Throw expression, Destructuring assignment, Testing Nullable, Arithmetic simplification, Tuple decomposition, Complex Pattern, Wildcard Pattern etc. Before C# 7, if you had to pass a variable as out parameter, then the variable must had been declared before passing it to the method. But in C# 7, you can declare variable directly when you are passing it inside a method. In the above screenshot, you can see that for C# 7 I am declaring an out variable inside method and it is being accessed from outside also. You may be thinking that if exception occurs, then what will happen in this case. If any exception occurred in that, the out variable will be assigned with a default value. You can see in the below screenshot that I have passed incorrect date and it has not been converted to DateTime, so a default value has been assigned to variable “date”. 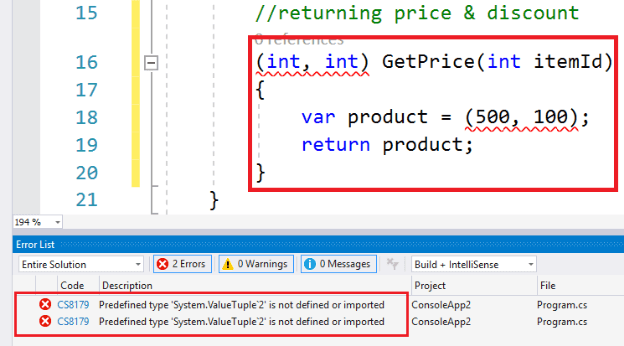 In the above code, I want to pass ItemId as parameter and want two return values – Item price and discount. But, if you would run the above code directly in Visual Studio 2017 RC, then it will not work. To make it work properly, you have to do a bit extra. I am going to explain all those steps one by one here. Below is a screenshot of error which you will get at the first attempt. Now, move to its solution. Install “System.ValueTuple” from NuGet Package. Select “Manage NuGet Packages…” from context menu. Now, re-build your solution. You will notice that error has been removed and your application is built successfully. Now, you may be thinking how to utilize or call this tuple method. It’s very simple. Just have a look at the below code snippet. But, if you watch the above code snippet closely, you will notice the naming convention issues. I am accessing price with property “Item1” and discount with name “Item2” but it would be better if I have accessed it using their names directly. We can also do that. Let’s have a look at the below code snippet. You will notice that I have replaced less meaningful names “Item1” & “Item2” with “price” & “discount” respectively. Internally, you can use any variable name for tuple but externally, it will always return with the same name that is written as return type. Both can be accessed by “price” & “discount” irrespective of their internal names. You can do a lot more with tuple. I will explain more about these in coming section and you can also do experiment by yourself. Till now, you have seen that we can access tuples in different ways like accessing with “Item1”, “Item2” or with some meaningful names, like price and discount. Still, we need to access those properties with a collection name like “product.price”. 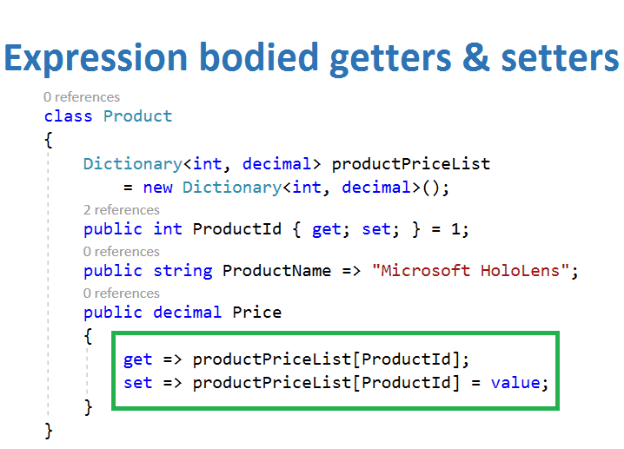 A question must be arising in your mind – can I use the variable name “price” directly without using any other collection name. The answer is obviously YES. We can say that “deconstruction” is a concept which allows us to access a tuple member directly with its name without using any tuple variable name. Or, you can also say that “deconstruction” is a concept which allows us to split tuple members and we can use it directly with their respective names. Expression bodied member is not a new concept in C#7. It has been introduced with C#6. 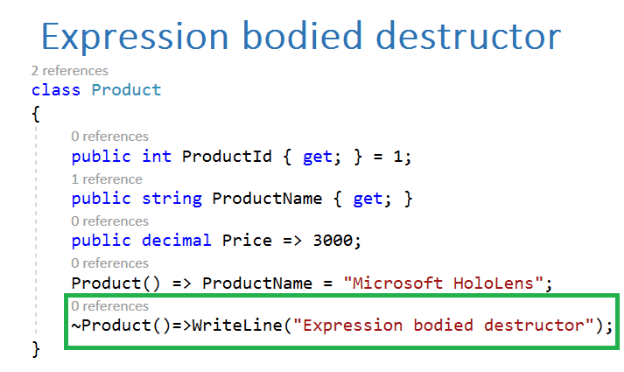 But in C#7, some more enhancement has been done for expression bodied members. If you are not aware about expression bodied members, then try to understand it from beginning. If you want to go in depth, then please go through these 2 articles. 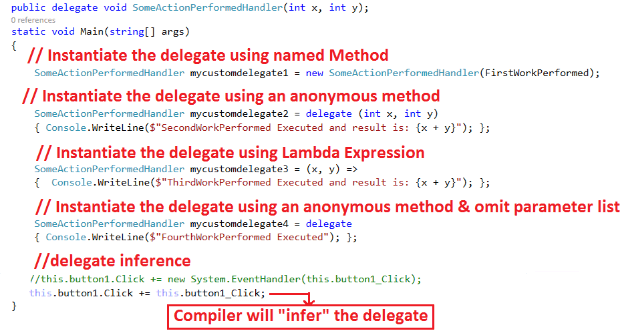 In C# 6, Microsoft introduced a new feature Expression-bodied Methods which was very similar to and inspired by anonymous & lambda expression. But there are some differences between these two. In the case of Expression-bodied methods, it must have a return type, name, and returned expression. We can use access modifiers (private, public, protected, internal and protected internal) with expression-bodied method. We can declare it as virtual, static, or it can also override its parent class method. It can be asynchronous if it is returning void. Expression bodied method has access modifier as public and return type string. For more details, please visit my blog Expression-Bodied Properties in C# 6. 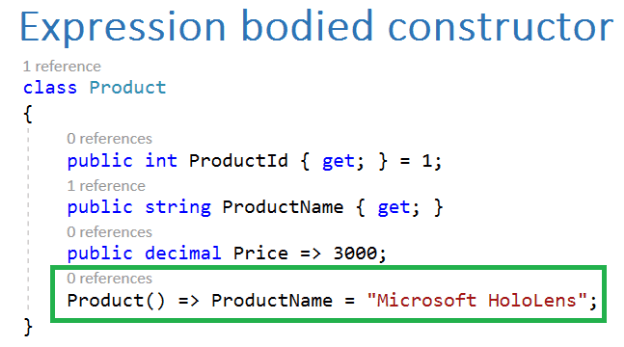 In C# 7, we can declare a constructor as “expression bodied members”. Below is a code snippet for the same. It is not necessary to use property inside getter or setter expression. We can also use a variable inside getter and setter. So, the above code can also be written as. Most of the developers must be aware about C# “ref” keyword and its behaviors. As we know that it returns address of the variable rather than value and it can also be used with reference type where new memory allocation has to be done in the calling method. If anyone is not aware about ‘ref’ keyword or wants to brush basic concept of C#, then please go through the article. 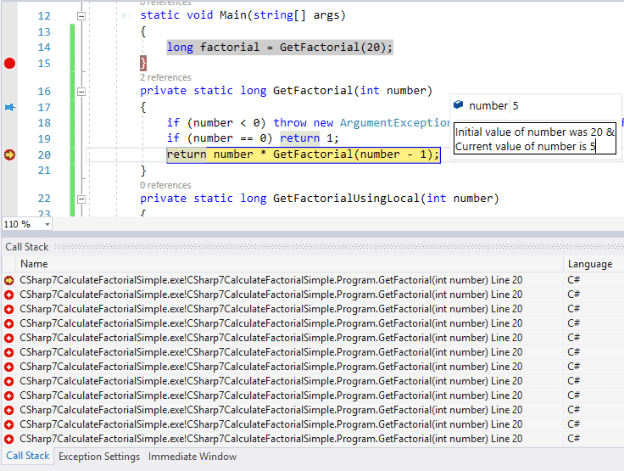 But till C# 6, we can only use ‘ref’ keyword while passing a parameter for method. 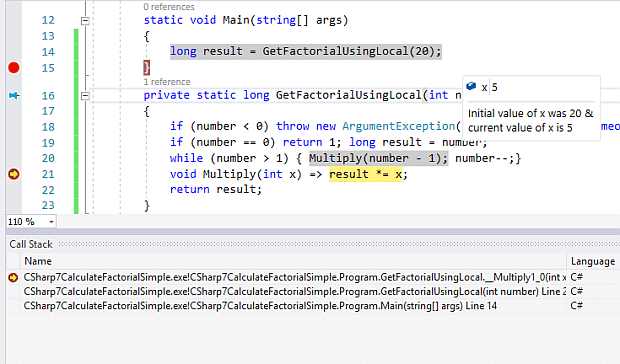 In C# 7, we can also use ‘ref’ for returning a variable from a method i.e. a method can return variable with reference. We can also store a local variable with reference. As you have seen, in the previous example I am searching for an odd number inside an integer array and if it is not found throwing exception, the method is not returning it as value but as reference. So, you need to store that value also which has been returned as reference. To store it in a local variable, we can use ‘ref’ keyword with local variables, known as ref locals. In the above screenshot, you can see that first time the variable “OddNum” is storing the value 33 with its reference inside the array ‘x’. 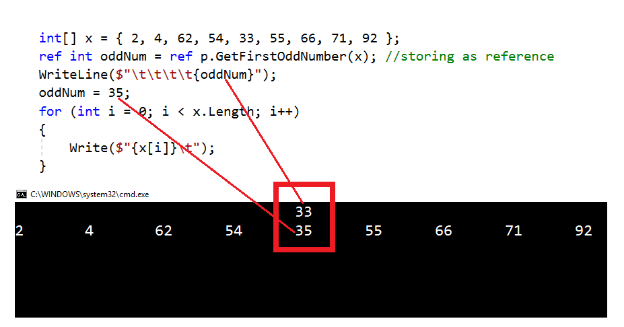 If you print “oddNum” first time, then it will print 33 but after that, I have re-assigned its value and set “oddNum =35” now iterating the array and printing elements of array and you can see that whatever I have done, modification for “oddNum” from outside is also reflecting inside the array and internal value has been modified from 33 to 35. 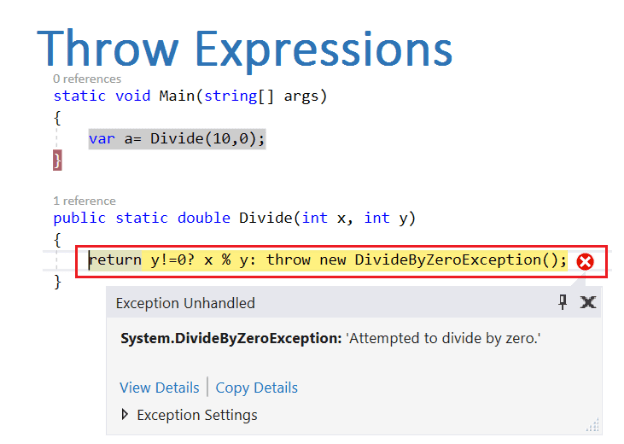 In C# 7, we can throw an exception directly through expression. Thus, an exception can be thrown from an expression. 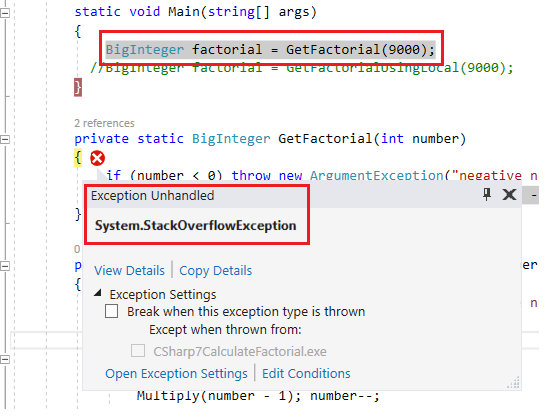 We can throw any type of exception through the expression like “IndexOutOfRangeException”, “NullReferenceException”, “OutOfMemoryException”, “StackOverflowException” and many other types of exception. Apart from the above-mentioned features, there are some more features for C# 7, that have been proposed like generalized async (Generalized async return), Replace (Partial Class Enhancements) Records (or Record Types) Non-Nullable Reference Types, Immutable Types etc. December 21, 2016 in Technology Review.